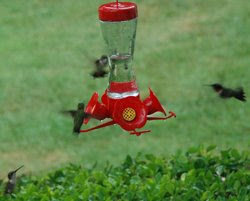 As summer progresses, the hummingbird collection at the Mountain Rose Inn continues to grow. These beautiful little birds are whirring all along the front porch in their hurry to get to the feeder for that next sip. Their antics as they attempt to keep other birds from feeding are quite funny to watch. One recent evening, we counted 14 at one feeder. Guests sitting on the front porch are treated to the faint buzzing noise that their wings make and the many squeaks of outrage that come when one finds that some other feathered friend has taken his place at the feeder. What a delightful way to spend a summer afternoon.